Dr. Mark Johnson, chairman of neurosurgery at UMass Memorial Medical Center and a professor at UMass Medical School. Dr. Robert Maupin, professor of clinical obstetrics and gynecology and maternal/fetal medicine at LSU Health Sciences Center. Associate dean for diversity and community engagement at LSU Health New Orleans School of Medicine. Dr. Shamard Charles: "As a black male physician, when you sort of move up the ranks, you realize that you often come from a pool of just a handful of black men who look like you. There's this visceral feeling that there is unequal representation in medicine. But we wanted to see if the numbers supported the visceral feeling that we see when we look around. We did a deeper dive using data from the Association of American Medical Colleges (AAMC) to see if the data corroborated our feeling. Thirteen percent of the U.S. population is black, but just 4 percent of doctors are black, reflecting the unequal representation that exists within the profession. In 1986, over half of black medical school graduates were men, but in 2015, data reported by the AAMC showed that there was a drop from 57 percent to 35 percent, even as the number of black male graduates in all fields has increased. It's a significant drop." SC: "I think that there is actually a really wonderful study that was conducted by the National Bureau of Economic Research that really sheds light on this. Black men were found to be much more likely to select every preventative service offered by their doctor, especially if it were invasive services, if the meeting was conducted by a doctor of the same race. And they also found that just by employing these cardiovascular preventative measures alone, could reduce the black-white male gap in cardiovascular mortality by 19 percent. So that's to say that if a black person comes to me for care, the likelihood that they would actually listen to me, the data, the objective data, show that they would be more likely to not just listen and sort of understand the information, but to also carry it out, to also do it. So it's really affecting black men in a way that's profound. It's really saving lives." Dr. Mark Johnson: "I graduated from medical school in 1995 and matriculated in 1986 — the M.D./Ph.D. took nine years. But one of the things that has changed over time, I think, has been the public's attention to this problem. As there are successes, high-profile successes, of African-Americans who have achieved in a variety of areas, there has been a narrative that the problem has been solved. When I was attending college and high school, the country was really still dealing with the effects of the civil rights movement, the [Martin Luther] King assassination, and everyone was focused on trying to address these issues. Since that time, there have been a number of legal decisions which I think have muted the ability of institutions to really engage those problems — questions of fairness, equity, race, quotas — which have caused many institutions, including medical schools, to be more reserved in the kinds of approaches that they can use to address this." "If a black person comes to me for care, the likelihood that they would actually listen to me, the data, the objective data, show that they would be more likely to not just listen and sort of understand the information, but to also carry it out." SC: "I think that the structural challenges, we definitely need to highlight those. But I think that, really, it starts very, very, very early on. Before we can even address structural changes, I think that introducing black men to doctors very early on in the academic process, via career days and as adjunct counselors in the school, for example, I think that goes a long way. I think Dr. Marc Nivet said this wonderfully in my piece: 'We cannot be what we don't see.' And so, I think that starting very early on, by introducing black men to black doctors, that will sort of drum up interest. I think the second thing is raising the bar for black men in America. I think that we see time and again in different sociocultural groups that setting the bar high academically and socially results in higher achievement. I think the third thing is to better incentivize doctors, especially within the black male community, by creating pipeline programs for high-achieving black students, providing financial support to institutions that have shown a great historic track record at graduating black medical students, and then looking for teachers and recruiters." Dr. Robert Maupin: "When we've looked at our national priorities in terms of addressing the challenges that we have with health disparities that play out across all communities throughout the country, it's been clearly identified that diversifying the medical workforce is one of the central pillars that has to be part of our core strategy. So this is, without question, an important priority, and one that's been recognized, one that we now have to find effective means of addressing." NBC News: "The dearth of black men in medicine is worrisome. Here's why." 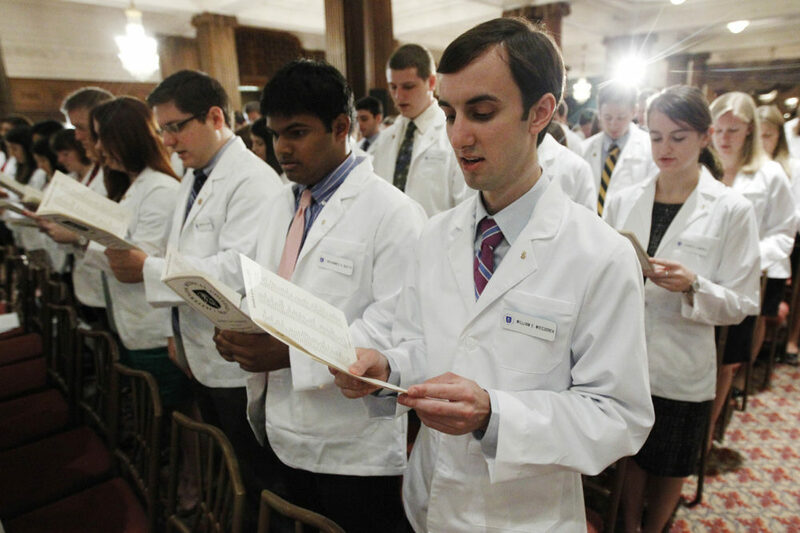 — "Calvin Lambert recalls entering an empty lecture hall as a first-year medical student, feeling overwhelmed and ill-equipped to handle the rigors of medical school and assimilation to a new environment. "Lambert, 31, who grew up in Roosevelt, New York, an ethnically and racially diverse community, wondered if he would ever fit in. "He waited anxiously to see if he would be the only black student in the class — an all-too-familiar experience as a pre-med student at New York University — but sighed in relief when he saw four other black men walk into the lecture hall. 'I was unnerved by the idea of ‘forcing’ myself to fit in to a culture that was seemingly the antithesis of who I am,' said Lambert. 'So I was relieved to find people whom I could share this experience with … people who looked like me, talked like me, and could understand me.'" New York Times: "The Secret to Keeping Black Men Healthy? Maybe Black Doctors" — "Black men have the lowest life expectancy of any ethnic group in the United States. Much of the gap is explained by greater rates of chronic illnesses such as diabetes and heart disease, which afflict poor and poorly educated black men in particular. "But why is that? Lack of insurance? Lack of access to health care? "Now, a group of researchers in California has demonstrated that another powerful force may be at work: a lack of black physicians. "In the study, black men seeing black male doctors were much more likely to agree to certain preventive measures than were black men seeing doctors who were white or Asian." Atlanta Black Star: "Doctor Explains the Importance of ‘Code-Switching’ When Dealing with Black Patients" — "Had it not been for his quick thinking, a Black doctor says his patient would’ve gone home with zero understanding of what was to come after receiving a life-changing diagnosis. "In a series of tweets, user @Oga_DoctorBlue highlighted the need for more Black men in the medical field, as they can relate to Black patients in ways white doctors cannot. That was the case during a visit from a patient who came in complaining of muscle weakness." This program aired on September 3, 2018.